Joe Louis 29 cent stamp 1993 U.S. 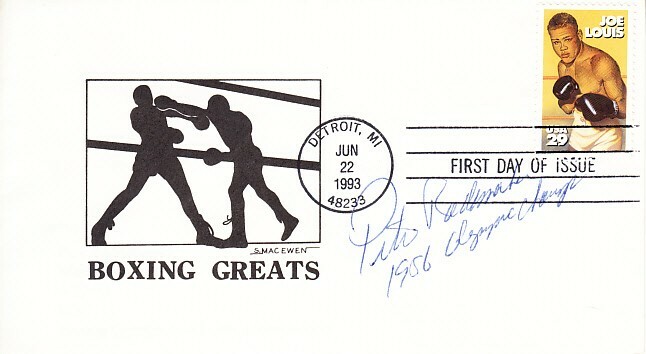 Postal Service First Day Cover autographed in blue ballpoint by former heavyweight boxer Pete Rademacher and inscribed 1956 Olympic Champ. 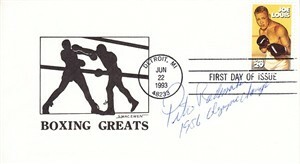 Rademacher, in addition to being an Olympic gold medalist, is the only man in boxing history to fight for the world heavyweight title in his first pro fight, losing to Floyd Patterson. With certificate of authenticity from AutographsForSale.com. ONLY 2 AVAILABLE FOR SALE.